The lotus is a symbol of absolute purity; it grows from the dark watery mire but is completely untainted or stained by it. The blue lotus (Skt. utpala) or 'night lotus' is a symbol of purity and compassion, and is usually depicted with eight, sixteen or thirty-two petals. 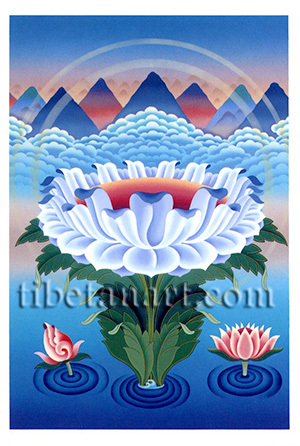 On either side of the central blue lotus are two small red lotuses (Skt. kamala). Collectively these three lotuses represent various Buddhist trinities, such as the Buddhas of the three times, past, present and future.